Republican U.S. presidential nominee Donald Trump appears at a campaign rally in Panama City, Florida, U.S., Oct. 11, 2016. Republican Party presidential nominee Donald Trump says that he is probably better off without the support of some members of his party. Many leading Republican officials recently withdrew their support for Trump, including the Speaker of the House of Representatives, Paul Ryan. The Republicans’ withdrawal followed the release of a video from 2005. In it, Trump said that he kisses and touches women sexually without their permission. “…when you’re a star, they let you do it. 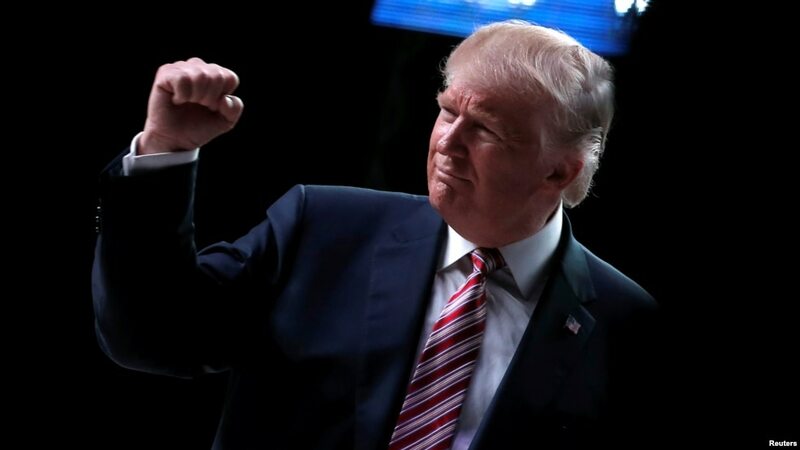 You can do anything,” Trump said. That includes, he continued, grabbing women in their private areas. The Washington Post newspaper first published the video. In it, Trump was speaking off-camera to journalist Billy Bush. At the time, Bush hosted the entertainment news program Access Hollywood. The two men were on a bus going to a television studio. They were speaking informally but wearing microphones that recorded their conversation. Trump later apologized for the comments he made on the video. He called the conversation “locker room talk.” In other words, the conversation included rude, sexual language between men that was not meant to be heard in public. Trump added Tuesday in a Fox News interview that many women have told him they have heard much worse. "If that's what it is going to take to lose an election, that will be pretty sad," Trump said in the interview. Since the video was released last week, Trump has fallen sharply in national polls. He now trails Democratic presidential candidate Hillary Clinton by 14 points. A week ago, the polls showed Clinton leading by only seven points. Republicans who have withdrawn their support for Trump include former Republican presidential nominee John McCain. In his interview Tuesday on Fox News, Trump said that Ryan and other powerful Republicans would support him in office if he wins the election. President Barack Obama’s administration said Obama found Trump's remarks about touching women "repugnant," or disgusting. He said he considered it sexual assault. Women voters, including longtime Republicans, have also been turned off by Trump’s 2005 comments. Esther Rosser is a 71-year-old grandmother from Virginia. She has voted for Republicans candidates her whole life. But she said she has decided to vote for Democrat Hillary Clinton, in part because of Trump’s remarks about women. LeighAnn Chase is a 27-year-old registered Republican voter from Florida. She told Reuters that she “can’t in good conscience vote for someone with that kind of mindset to the presidency.” She said she is now supporting Clinton. But some women voters are sticking with Trump. Amy Fryzelka is from Missouri. She told Reuters she thought Trump’s remarks were “horrible,” but she believed his personal life would not affect how he would govern. She said she will probably vote for Trump because she does not trust Clinton. "I'd prefer not to vote for either of them, really," Fryzelka said. Trump apologized again for his 2005 words during Sunday's presidential debate with Hillary Clinton. He said he was embarrassed about what he said. But he also said that Clinton threatened several women who had accused her husband, former President Bill Clinton, of sexual attacks. Trump gave three of those women seats at the debate and pointed them out to the audience several times. On Tuesday, Hillary Clinton ignored the sexual assault issue. She spoke in Miami, Florida, about what she called a global crisis: climate change. She said the U.S. could take the lead in dealing with it. Clinton said she fully backed the Paris Agreement on climate change. She reminded the crowd that Trump has called global warming a Chinese-created hoax. Caty Weaver and Ashley Thompson adapted this VOA News story for Learning English, with additional materials from Reuters. Kelly Jean Kelly was the editor. Share your thoughts in the Comments Section or post a message on our Facebook page. A new study suggests there may be a limit to how long people can live. American researchers found that the longest a human being can live is about 115 years. The researchers are with the Albert Einstein College of Medicine in New York City. Their findings were published in the journal Nature. The study was based on mortality and population records from the Human Mortality Database. The database has a collection of records from more than 40 countries dating back to 1900. The researchers found that the average life expectancy has risen greatly since the 19th century. This has resulted partly from developments in modern medicine, including the use of vaccines, antibiotic drugs and improved treatments for cancer and heart disease. In addition, there have been many improvements in public health and nutrition. In 1900, someone born in the United States could expect to live 47 years. Today, Americans can expect to live to an average age of 80. According to the U.S. Central Intelligence Agency, the Mediterranean nation of Monaco has the highest average life expectancy in the world -- 89.5 years. Next are Singapore and Japan -- each at 85 years. The oldest documented person to ever live was Jeanne Calment of France. Calment was 122 years old when she died in 1997. An Italian woman, Emma Morano, is currently recognized as the world's oldest living person. She is 116 years old. Researchers in the new study said their findings suggest that the greatest average human lifespan was reached during the 1990s. They noted that some individuals born in the U.S., France, Japan and Britain lived to be at least 110 years old between 1968 and 2006. But the number of people living past 110 years is very small, and considered not reachable by most of the population. The study found that survival rates have improved since 1900, with some older adults living to age 100 and above. But then many of those individuals died a short time later, regardless of when they were born. The head of the study, Jan Vijg, is head of the genetics department at Albert Einstein College of Medicine. 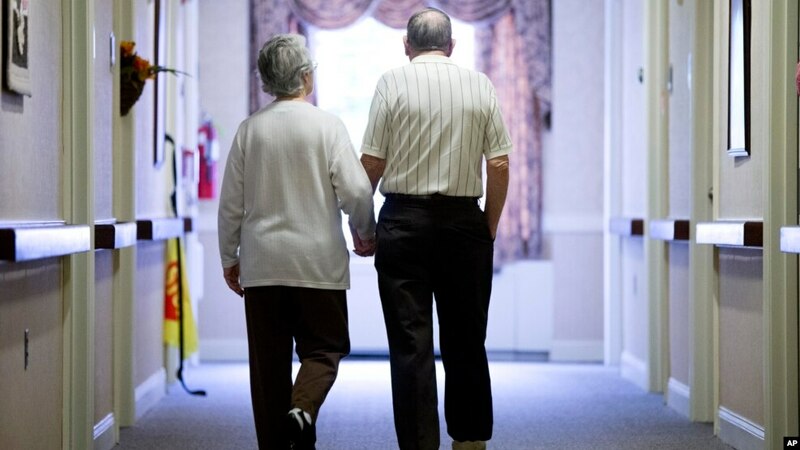 He said the findings show a decrease in the ability to reduce death rates among older adults. He said this suggests a possible limit to human lifespan. Jan Vijg noted that continued medical developments to improve the quality of life - especially in the developed world - could push average life expectancy beyond 80. But he said researchers still do not expect the average human lifespan to ever break 100. Jessica Berman wrote this story for VOANews.com. Bryan Lynn adapted it for Learning English, with additional information from a report by Reuters. George Grow was the editor. sanitation – n. – process of keeping places free from dirt, infection, disease, etc. Roller coasters are fast and exciting. But passing a painful kidney stone is not. The process is painful and can take a long time. But American researchers have found that a roller coaster ride just might help those suffering from a kidney stone. They say such rides help patients pass the stones with a 70 percent success rate. The findings come from researchers at Michigan State University. They published their findings in The Journal of the American Osteopathic Association. David Wartinger led the study. He says he became curious after hearing many stories of people who passed kidney stones after going on a fun ride at a theme park in Florida. Patients told him that after riding a “roller coaster at Walt Disney World, they were able to pass their kidney stones.” One man even said he passed three different stones after going on the ride more than once! To test whether the claims were true, Wartinger used a 3-dimensional model of a hollow kidney. Inside the model he placed three kidney stones, each no larger than 4 millimeters. Then he placed the man-made kidney into a backpack. The researchers put the kidney on Disney’s Big Thunder Mountain roller coaster for 20 rides. 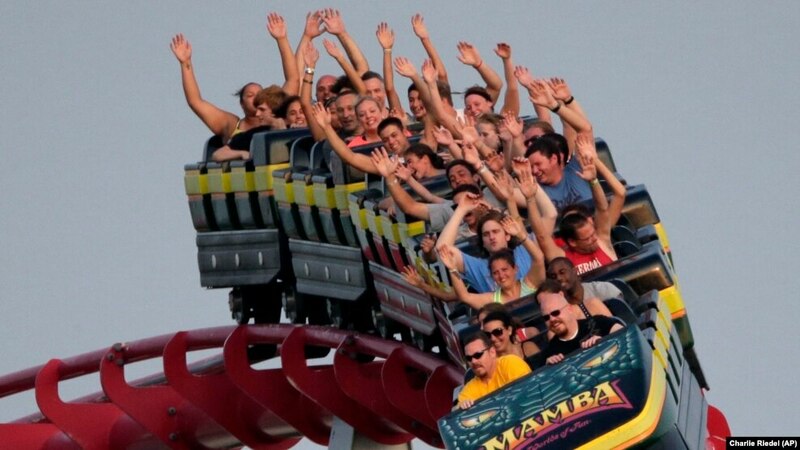 Wartinger found that where the person sits on the roller coaster can make a big difference. He said “in the pilot study, sitting in the last car of the roller coaster showed about a 64 percent passage rate.” Sitting in the first few cars only had a 16 percent success rate. Researchers decided to expand the study. They rode the same roller coaster with several kidney models. When sitting in the back car, the success rate of passing the stones was 70 percent. It also mattered where the stones were located in the kidney. The researchers found that stones located in the upper part of the kidney model were passed 100 percent. Another variable – it depends what kind of roller coaster. When it comes to passing kidney stones, not all roller coasters are equal. They found that “Big Thunder Mountain was the only one that worked.” The other two roller coasters both failed the test. Wartinger said the other rides were "too fast and too violent." The movement forced the stones against the side of the kidney. He said that the ideal roller coaster is rough and quick with some twists and turns. About 300,000 people in the United States go to hospital emergency rooms with kidney stones each year. One common treatment for kidney stones -- called lithotripsy -- breaks up larger stones into smaller ones. But Wartinger said the treatment can leave many smaller stones. To solve this problem, he suggested riding a roller coaster “after a treatment when the remnants are still small." Wartinger thinks roller coaster rides could also be used as a preventative measure. He said that a yearly ride on a roller coaster could even prevent stones from developing. "You need to heed the warnings before going on a roller coaster," he said. "If you have a kidney stone, but are otherwise healthy and meet the requirements of the ride, patients should try it." He adds that it’s “definitely a lower cost alternative” to other treatments. And riding a roller coaster is definitely more fun! VOANews.com reported on this story. Anna Matteo adapted the story for Learning English. George Grow was the editor. 3-dimensional – adj. An object that has height, width and depth, like any object in the real world. The U.S. government’s top education official wants schools to do a better job teaching students whose first language is not English. 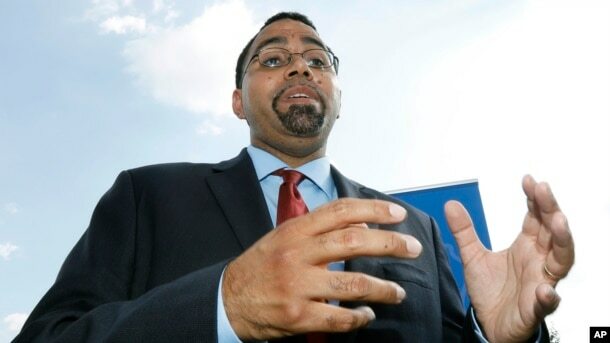 U.S. Education Secretary John King said the issue is important. That is because one in every 10 U.S. students from grades Kindergarten to 12th grade are English learners. Most English learners arrive from a country that speaks another language, or have parents from a non-English-speaking country. There has been progress in recent years, King said. 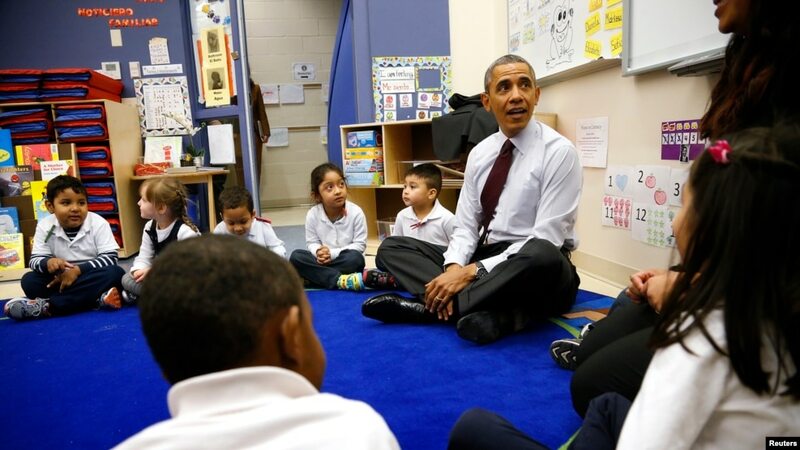 He noted Spanish-speaking students are graduating high school and attending college at higher rates than ever before. “But in too many places across the country, English learners get less -- less access to quality teachers, less access to advanced coursework, less access to the resources they need to succeed,” King said. King said a new federal law called the Every Student Succeeds Act can help. It allows school districts more ways to use federal money to improve programs for English learners. That includes better training for English language teachers. Kelly Gonez is a policy adviser at the Department of Education. She said research shows giving instruction in two languages, English and the student’s native language, is better for English learners. Although it takes them a little longer to master English, they do better on tests that measure reading and math skills, Gonez said. So do people who enter dual-language programs already proficient in English, Gonez said. To be proficient means able to read and speak a language. Sarah Catherine Moore is director of online learning at the Center for Applied Linguistics in Washington D.C.
She said two recent studies found English learners do better if they attend classes that use both English and the student’s native language. But Gonez said such programs are still not offered by a majority of schools teaching English learners. One problem is finding enough qualified teachers. Gonez said some school districts are hiring teachers from Spain and China. They are trying to make up for a shortage of teachers in the United States who can offer instruction in two languages. But such programs are not always easy to set up. In New York City, for example, the city’s Department of Education says its students speak a total of 180 different languages. 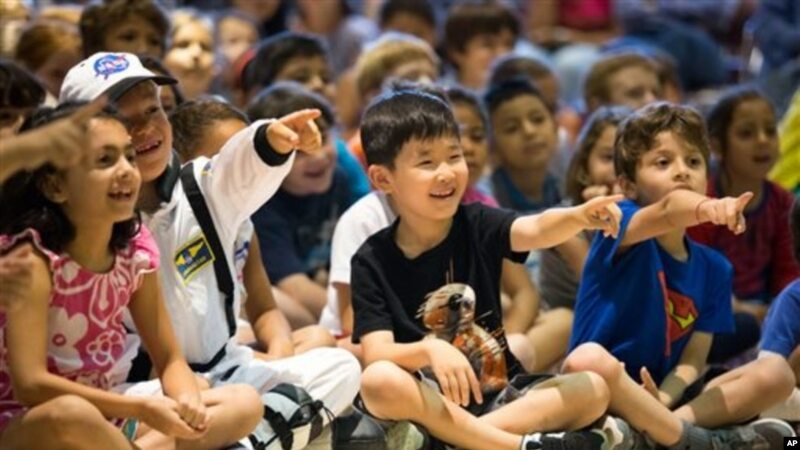 About sixty percent are Spanish speakers, and another 14 percent are Chinese speakers. It also has 6,546 students who speak Bengali, 6,501 who speak Arabic, and 3,591 who speak Haitian-Creole. Thousands more speak Russian or Punjabi. Gonez said that it may be hard to find instructors who can speak all the different languages spoken by students. But she said schools can get educational material in many more languages that just Spanish and Chinese. Terry Richards is in charge of federal programs for the state of Delaware. She welcomes the new federal education law. It will allow state and local education departments to make more decisions about how to teach English learners, she said. Richards said the law permits local school districts to consider “local” needs in developing English education programs. Bruce Alpert reported this story for VOA Learning English. ­­­­­­­­­­­­­­­­­­Mario Ritter was the editor. We want to hear from you. Write to us in the Comments Section and share your views on our Facebook Page. Tell us how you learned to speak another language! Our national parks journey this week takes us to the western state of Colorado. There, you will find a 77-kilometer-long canyon. Its exposed rocks are among the oldest you will find on Earth. The canyon is so narrow and so deep that sunlight shines only briefly at the bottom at midday. That frequent darkness is what has given this canyon its name. 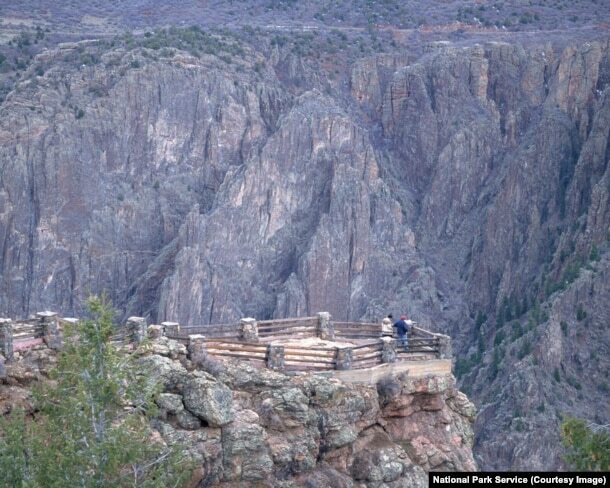 Welcome to Black Canyon of the Gunnison National Park! Black Canyon seems impossibly steep and narrow. 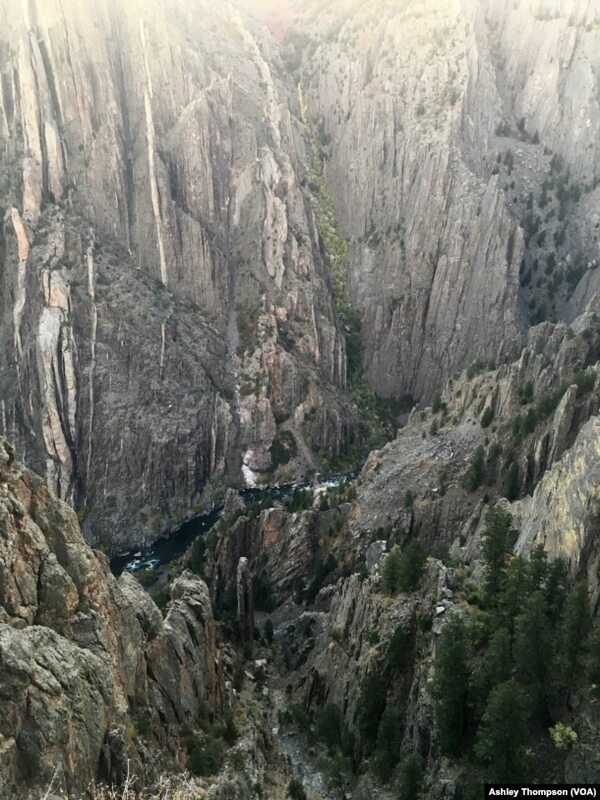 The fast moving Gunnison River formed the canyon over millions of years. As the river flows through the canyon, it drops an average of 18 meters per kilometer. The Gunnison River loses more elevation in its 77 kilometer canyon stretch than the Mississippi River does in 2,400 kilometers from Minnesota to the Gulf of Mexico. This loss in elevation causes the river to gain speed and force. Over time, that force has carved and cut the hard rock, and created the wild and jagged rock formations found at Black Canyon. That process is known as erosion. At its widest, Black Canyon is 14 kilometers. At its deepest point, it is 829 meters from the canyon edge to the floor. Black Canyon attracted little attention from early Western explorers. In fact, no early Spanish explorers to the southwestern United States reported seeing Black Canyon. The first written record about the canyon came in 1873. The Ute Indians certainly knew of Black Canyon. But only its rim, never the gorge, shows evidence of past human occupation. 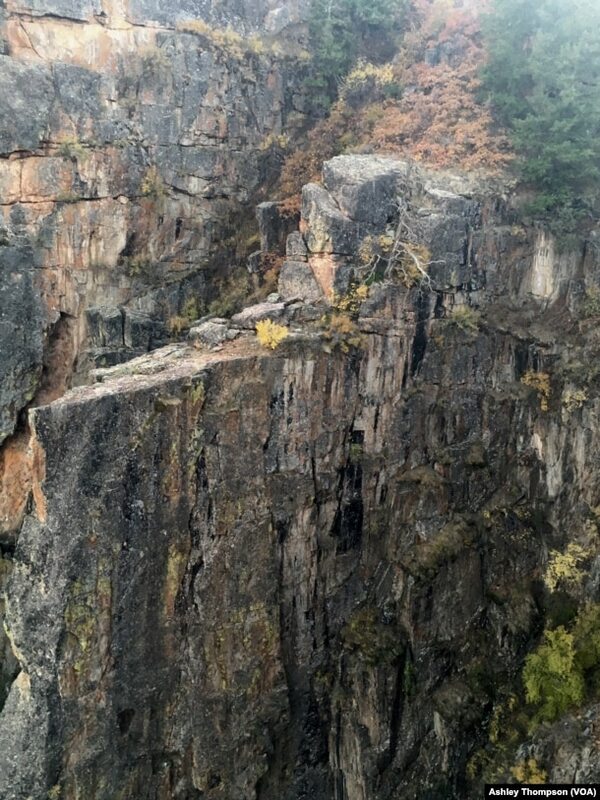 Even today, the depth and steepness of Black Canyon make it extremely difficult for humans to access. Birds, however, have no problem surviving in the canyon environment. Black Canyon is home to many kinds of birds. They live at the canyon rim, along its walls, and by the river. Mountain bluebirds and great horned owls live in the rim area. 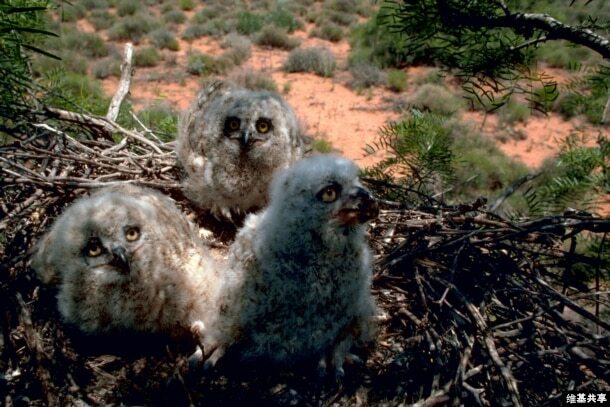 The owls eat seeds and berries from the pinyon, juniper and oak trees found there. Canyon wrens sing loudly within Black Canyon. Visitors are more likely to hear the birds than seen them. They build their nests on flat surfaces of the canyon walls. So do peregrine falcons. They prey on other birds. They dive at speeds up to 300 kilometers per hour to catch them. American dippers build their nests in the gorge, next to the Gunnison River. A gorge is a narrow valley between hills or mountains. These dippers feed on insects and small fish. Some people come to Black Canyon of the Gunnison National Park for world-class birdwatching. But, it is the canyon itself that appeals to most visitors. 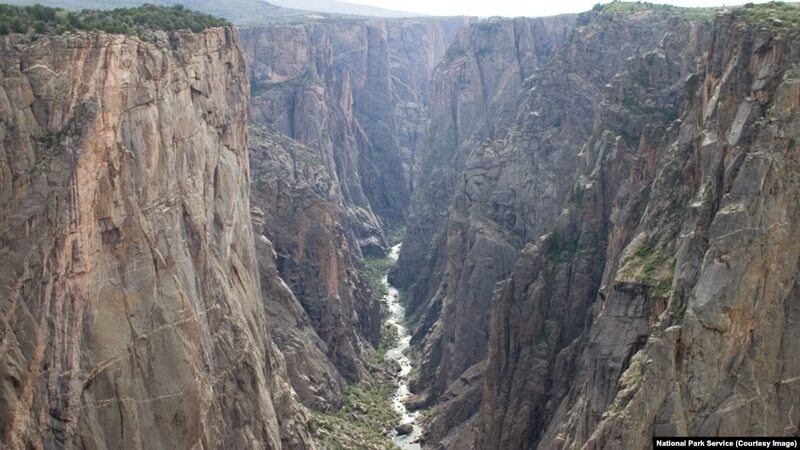 Walking along the rim, seeing the canyon’s towering cliffs, and hearing the powerful flow of the Gunnison River far below is an overwhelming experience. At Black Canyon, visitors can view some of the planet’s oldest exposed rocks. They are Precambrian rocks. Precambrian accounts for the Earth’s history from its very beginning up until about 540 million years ago. Precambrian rocks are described as “basement rocks” because they are usually buried deep under the surface. The only become exposed when younger rocks have been cut away by erosion or other forces. 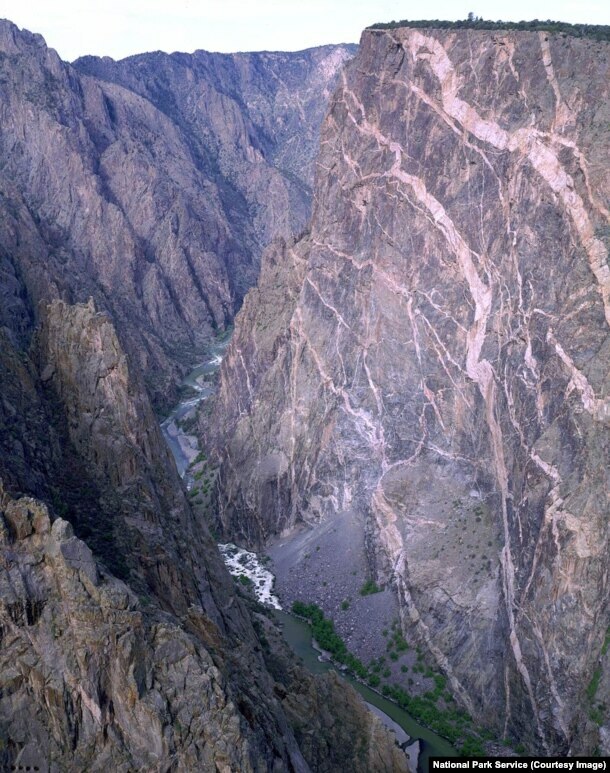 At Black Canyon, the Gunnison has eroded the canyon walls so greatly that Precambrian rocks have become visible. Often, the canyon’s rock walls look like works of art. Different kinds of rocks fold together and form colorful patterns. The patterns change as the sun hits different parts of the walls. One area of the canyon is known as Painted Wall. It is the highest cliff in Colorado. Long pink bands of rock cover this section of the canyon, as if a person took a paintbrush to the wall. This pattern formed as hot liquid from below the Earth’s surface forced its way into rock cracks. As it slowly cooled, large crystals formed. The bands get their pink color from a crystallized mineral called potassium feldspar. Local people knew how just special Black Canyon was. They began urging Congress to protect the canyon in the 1930s. It became a national monument in 1933. And in 1999 it became a national park. The park protects more than 22 kilometers of the canyon. Most visitors spend their time exploring the canyon rim by foot or by car. Several kilometers of trails lead to many overlook points. A road also leads to several breathtaking views. Some adventurous travelers choose to explore this wilderness by hiking down to the inner canyon. There are no marked trails to guide them. Hikers must first get a wilderness use permit. These permits are free, but only a limited number are available each day. Many of the paths are difficult to follow. Some are also dangerous. The Warner Point trail, for example, drops more than 820 meters. Walking down takes more than two hours. Walking back up can take up to four hours. The park service warns that poison ivy grows wildly in the inner canyon. There is also the risk of falling rocks. Ashley Thompson reported and wrote this story with materials from the National Park Service. Caty Weaver was the editor. A customer holds a Samsung Electronics Galaxy Note 7 smartphone at the headquarters of South Korean mobile carrier KT in Seoul, South Korea, Friday, Sept. 2, 2016. A plane was evacuated Wednesday in Louisville, Kentucky, after a passenger reported smoke coming from a Samsung smartphone. All passengers were safe after getting off the Southwest Airlines plane. The plane was to travel to Baltimore, Maryland. The U.S. Federal Aviation Administration confirmed in a statement that a Samsung phone had caused the smoke. The agency did not say which Samsung model was involved and said it is continuing to investigate the incident. Samsung also did not say which smartphone model caused the emergency. The company said in a statement that it would examine the device. Samsung issued a recall of its new Galaxy Note 7 device last month after receiving several reports of overheating problems. The company said the overheating was linked to problems with batteries that caused some phones to catch fire. The recall reportedly covered at least 2.5 million phones worldwide. Sarah Green is the wife of the airplane passenger whose phone overheated. Green told the media that the phone was a new Samsung Galaxy Note 7. She said her husband, Brian, recently got the phone as a replacement following the Samsung recall. Green told Louisville’s Courier-Journal newspaper that her husband called from someone else’s phone to explain what happened. He told her the phone began making popping noises and started giving off smoke after he turned it off. “He took it out of his pocket and threw it on the ground,” she told the newspaper. The plane had not yet taken off. An official with Louisville’s Metro Fire Department confirmed the passenger threw the phone on the ground after it started smoking. The official said the phone caused minor damage to the floor where the device landed. The Federal Aviation Administration issued a warning to airplane passengers last month about the Samsung phones. It urged passengers not to use Galaxy Note 7 devices during flights. It also urged passengers not to put them in checked baggage. Flight attendants on many airlines have also added a warning about the Samsung devices during pre-flight safety demonstrations. Joshua Fatzick reported this story for VOANews.com. Bryan Lynn adapted it for Learning English, with additional information from reports by the Associated Press and Reuters. Ashley Thompson was the editor. We begin with bad news for people who bought a wearable fitness tracker in hopes of losing weight. A new study finds the electronic device probably does not help with weight loss. The study was a project of researchers from the University of Pittsburgh in the U.S. state of Pennsylvania. Fitness trackers are designed to record your physical activity. They are usually worn around the wrist, where they measure a person’s heart rate. The University of Pittsburgh research team looked at two groups of individuals. The first wore a fitness tracker and took part in health counseling. In other words, they spoke with nutrition and physical fitness experts to consider the best weight loss plan. The researchers compared this group with people who only took part in health counseling. The study found that those who simply had health counseling lost more weight than those who had counseling and wore a fitness tracker. In fact, those who only spoke with the health experts lost nearly six kilograms. Those who used a fitness tracker lost only 3.5 kilograms. The study involved 470 subjects between the ages of 18 and 35. Some of them were overweight, while others were heavier and considered obese. Over three fourths of the subjects were women, and 29 percent were minorities. The researchers told all the subjects to increase their physical activity. The men and women also were told to start on a low calorie diet. The subjects were told to have their weight measured once every six months over the two-year study. After six months, researchers divided the group into two parts: one continued with monthly counseling, while members of the other group were given a wearable fitness tracker. Eighteen months later, both groups "showed significant improvements in body composition, fitness, physical activity, and diet,” with no major difference between groups. However, when it came to losing weight, the people who spoke with experts lost nearly twice as much weight. More information is needed, he adds, to learn how to best use these devices to change “physical activity and diet behaviors” in adults who want to lose weight. The researchers published their findings in The Journal of the American Medical Association. Matthew Hilburn reported this story for VOANews.com. Anna Matteo adapted it for Learning English. George Grow was the editor. counseling – n. advice and support that is given to people to help them deal with problems, make important decisions, etc. What covers nearly 29 million square kilometers of this planet beneath the sea? Seamounts are mountains, usually volcanoes, that rise up from the sea floor. Some of the volcanoes are ancient, some are still active. But they are hard to find because they do not reach the surface of the water. Scientists say seamounts cover more of the earth’s area than deserts, tundra, or any other land-based habitats. Marine life gathers at seamounts because they carry nutrient-rich water upward from the sea floor. In September, a group of scientists set out to explore Cook Seamount. It rises almost 4,000 meters from the Pacific Ocean floor about 160 kilometers off the island of Hawaii. Humans have never seen it up close before. The Associated Press went with the scientists, and provided exclusive images and information about this seamount and the marine life around it. "Pisces V surface you're going in. Roger, going in." Three people went in a submarine down to over 900 meters below the ocean surface to the top of the seamount. As the blue waters became darker, underwater creatures that glow, by chemically creating their own light, began to swim past the submarine. The scientists dove below the level where sunlight can reach. They spotted some wonders-- like a rare octopus with big fins that look like elephant ears. One even changed colors as it swam by the submarine. Conservation International and the University of Hawaii worked together for the trip to Cook Seamount. Greg Stone is the lead scientist with Conservation International. He spoke to AP news service on the ship. He said humans know very little about seamounts, but they are a “key part” of what drives the ocean. Stone said he wants to find out what is living on the seamounts and how they support ocean life. M. Sanjayan is Executive Vice President of Conservation International. He told AP that there are “10,000, maybe 100,000” seamounts across the world’s oceans. He called them “hotspots for marine diversity,” and because most have not been explored, he expects that they will see things new to science when they get there. Sonia Rowley is a researcher at the University of Hawaii who is taking part in the project. She will be studying the samples taken from Cook seamount. Cook seamount is an extinct volcano, which means it is not active anymore. It is part of a group of undersea volcanoes known as the Geologist Seamounts, that are about 80 million years old and could hold many new animal species. They could also contain elements such as nickel and cobalt that mining companies could extract. One of the other two seamounts studied on their trip was Lo'ihi, an active volcano. Lo'Ihi has been studied by manned submersibles over the past 30 years. The scientists saw an “old friend” on Lo’Ihi—a shark they had seen there before. They also saw a two-meter long eel and a number of new geological formations around the volcano’s crater. Scientists say Lo'ihi could someday be the newest island in the Hawaii chain as volcanic activity pushes the seamount upward. But do not look for it to break the surface of the water any time soon. Estimates are that it will not be for tens of thousands of years, if ever. Caleb Jones of The Associated Press wrote the exclusive report. Anne Ball adapted his story for VOA Learning English. Mario Ritter was the editor. We want to hear from you. Write to us in the Comments Section, and find us on our Facebook page.